with overlapping bases on the upper front jaw. maximum weight for a blue shark. 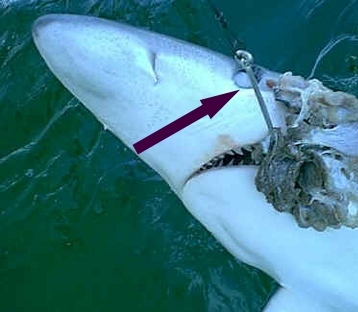 the blue shark's black eye. That helps in identifying them. over 400 lbs. The present IGFA record is 528 lbs., but all the previous records were in the 400s. Africa; and then make a return trip to New England sometimes via the Caribbean. the area in mid October but a few are still here into early November. Plenty of them were here in 2013. There are many blues here in the summer, and some will venture inshore into waist deep water. the tip of the pectoral fin hit his leg. blueshark. Reports of blues in shallow water have also been made in the Boston area. backyard. John is expecting to see a small shark, and wades out into the water. 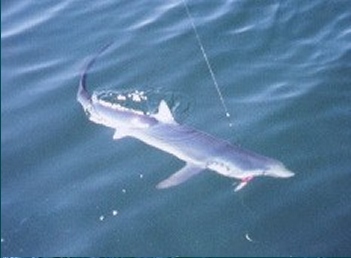 But it is a blue shark about 9 feet long and it gets between John and the shore. He snaps the above picture. lbs. It replaced the 454 lb Mass. State record as the new IGFA world Record. Length blue sharks have weighed between 337 lb and 407 lbs. from 1987 thru 2002. It has the weight and fork length of the sharks. 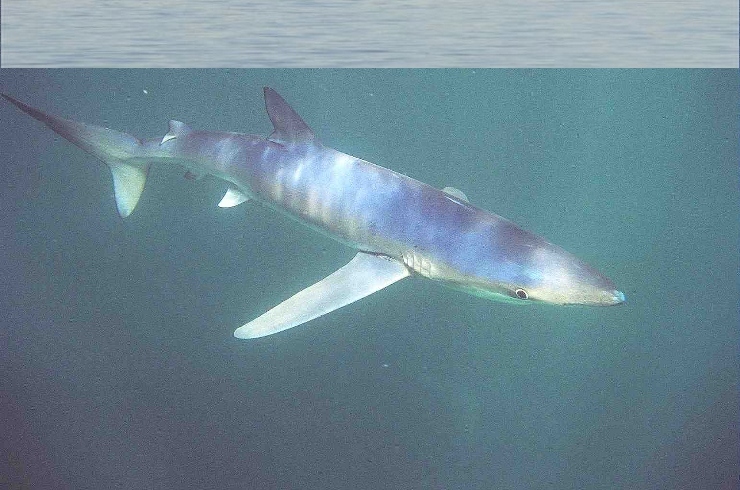 In that tournament every blue shark over 300 lbs was a male. the same as the 300 pounders They just get fatter. parts of the world. I believe because they are not as large as the males. won't cut it. Where's the beef? 7' to the fork about 7 years old. 20 years seems to be the expected life span. Blues are a rare catch in the U.S.
coastal areas of the Gulf of Mexico.